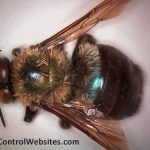 (Xylocopa species) Carpenter bees look like typical bumblebees but often lack yellow stripes. They are solitary bees. 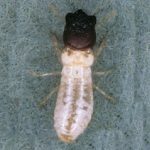 (Family Kalotermitidae) These social insects infest dry wood and do not require contact with the soil. 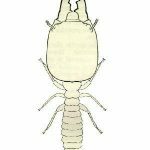 (C. formosanus) Originally from China, Formosan termites are the most voracious, aggressive and devious of over 2,000 termite species known to science. Formosan termites are a subterranean species of termite. 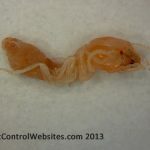 Swarmer formosan termite are about 1/2 inch in overall length, including their wings. (Lyctus brunneus) Powderpost beetles lay their eggs in cracks of wood and the larvae tunnel into the surface, filling it with a very fine powder-like dust. Powderpost beetles have long, narrow, flat bodies that allow them to easily attack wood surfaces. 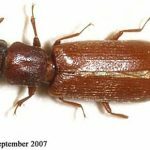 These beetles are reddish-brown in color.